Each December, I like to make a Christmas gift for parent volunteers and give them to all the parents that take time out of their busy schedule to help out in our classroom. I came across an idea on Pinterest, but wanted to change it up a bit. I decided to do a snow themed gift basket with some things that can help them relax over their Christmas break. To start, I was going to make some jars filled with white chocolate pretzels, mini Kit Kats, and yogurt raisins and turn them into snowman. I found these mason jars at Target and then got the blue ribbon and buttons at Hobby Lobby. The jars came with the labels and ribbon for only $4, but since I was going for a snow theme, I decided to change out the ribbon to blue. I added the buttons with some glue dots. I think it might look a bit better with all one type of candy/food, but oh well! Since I did find the jars in the Christmas section, they may not always be available. I did find these clear jars on Amazon which are cheaper too. I have provided the affiliate link to help you find them easier on Amazon. This alone would be a very cheap and great gift. I will give a few of my parent volunteers just this jar. I have a few parents that come weekly and help with center time, so I wanted to add a bit more to their Christmas gift. I found this adorable snowman mug at Hobby Lobby for 50% off for $5 and the blanket came from Wal-Mart and was about $5 too. 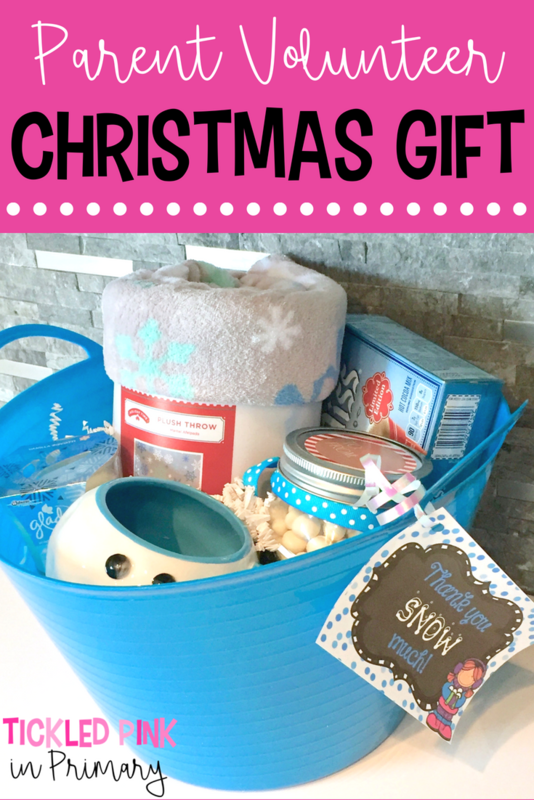 I found this basket at the Dollar Tree, added all of the gifts, and made up a cute little gift tag that says: Thank You “Snow” Much! The whole basket cost about $20. Here’s their finished gift. You can download this FREE gift tag here to make your own snow themed basket! I hope you’re able to use this idea for your own Christmas gift for your parent volunteers, colleagues, family, etc.